We’re back with another exciting month of product updates on Referral Rock. It goes without saying how important social media is these days, which is why it’s the theme of this month’s batch of new features and updates. Make it easy for your members to join your referral program, so they can start sharing faster without having to jump through additional hurdles. More and more people are starting to use Google and Facebook to automatically log in and register for different sites. They are less willing to fill in a registration form and instead, prefer to join using an existing social tool. Facebook and Google have become their digital keys to the rest of the internet, especially when accessing the web from mobile. Now, with just a few clicks, Members are able to join your referral program through Facebook and Google Single Sign-On (SSO), no form required. 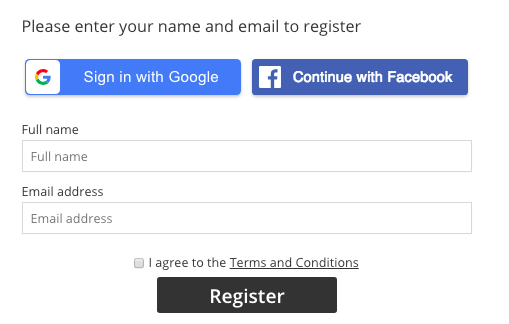 When enabled, this feature will display a Facebook and/or Google logo on the Registration Page (see image below). Once clicked, the Member will be asked to confirm their account and then they will be taken directly to their unique Member dashboard. This is a great way to simplify your registration process and increase member sign-ups. Set up SSO from the Program Editor Registration Page (under Form > 3rd-Party Login). You can also read more about in our Knowledge Base. With Google+ dissolving, it was time for the Member sharing options in our platform to get a little facelift. We’ve now replaced Google+ with Facebook Messenger and updated our email sharing blocks. Mobile sharing is becoming increasingly popular with our Members, so we made it even easier for them to get the word out about your brand! Alongside SMS and Whatsapp, Members can now share via Facebook Messenger from their mobile devices. Similar to the other social channels, you will predraft the Facebook Messenger message, making it easy for your Members to share with the click of a button. Turn this functionality on from the Member Page in your Program Editor and click on “Share Buttons.” You can also read more about our sharing options in our Knowledge Base. Our Email Sharing Blocks are a great feature to bring all your sharing options to your Member’s email inbox. They let your Members share pre-drafted messages directly from their email without having to open their Dashboard. 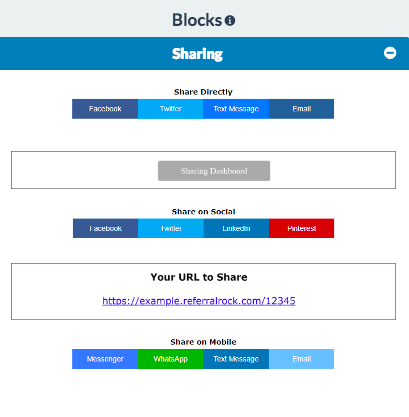 Now, when you open any email from inside Referral Rock, you will see the updated sharing blocks that you can insert into your Member emails, including one focused on mobile sharing. To read more about Email Management in Referral Rock, check out our Knowledge Base. We’ve also updated our automated Program Audits to reflect the new social features. Be sure to check those out to make sure you’re incorporating best practices. We will continue to improve our Audit rules to make it easier for you to incorporate best practices. As we do so, we could use your help. There is a new option to provide us feedback on the audit rules. So if you decide to ignore a rule, if you think a rule doesn’t apply, or if you have any new suggestions, let us know! Read more about our automated Program Audit in our Knowledge Base. We’ve got an exciting year ahead with a strong product roadmap. Continue to watch this space for new exciting features and please get in touch if you’d like to learn more or need help setting anything up within your program.